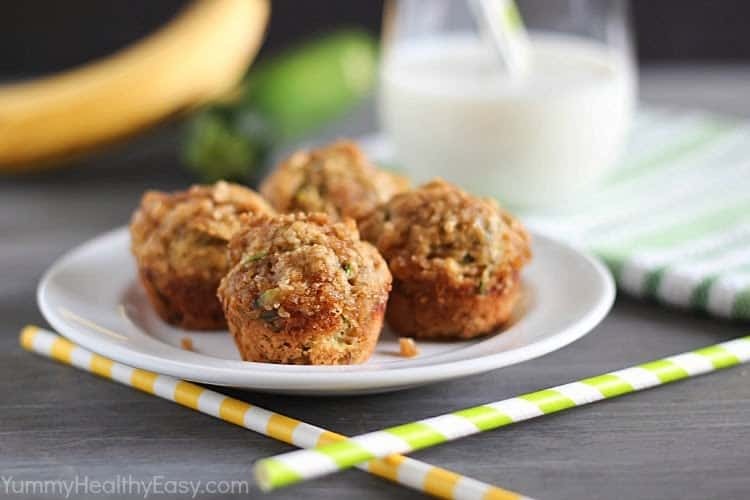 Healthy Banana-Zucchini Mini Crumb Muffins - Dessert Now, Dinner Later! Hi everyone! I’m Jen from Yummy Healthy Easy. I’m so happy to be on Dessert Now, Dinner Later today! I was super excited when Amber invited me to share a healthy recipe for her series: Healthy Food, Healthy You. 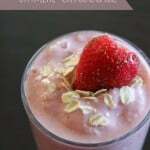 I’m a busy mom to four boys so I like to make and blog about meals that are quick, easy and healthy with the occasional treat thrown in. One of my New Year’s resolutions is to eat breakfast every morning. Is that a weird resolution?? Well, I got in a really bad habit of not eating breakfast and then about mid-morning, devouring my kids’ snacks – mostly goldfish crackers. Ha! I found that if I would eat within thirty minutes of waking up, I wouldn’t overeat later. The same thing goes for eating healthy snacks in the afternoon. If I ate a healthy snack at about 3pm, I would eat a smaller portion for dinner and be filled up quicker. 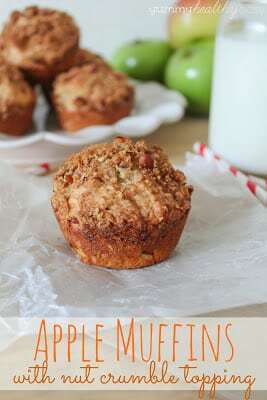 These little muffin bites are the perfect healthy breakfast or snack! 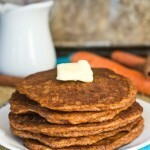 They’re made with white whole wheat flour, Truvia sweetener instead of sugar, and coconut oil. 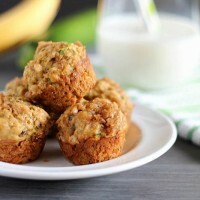 Plus they have bananas and zucchini to make them even healthier, moist and flavorful. 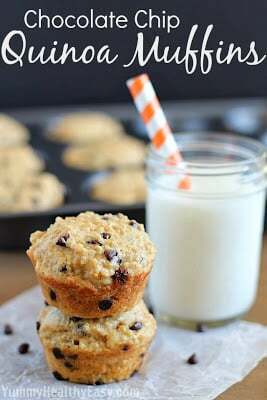 The best thing about these muffins is that you can finally use up those brown bananas that are sitting on your kitchen counter! After I make a batch, I keep them in a large airtight bag or container on the counter then will divide whatever hasn’t been devoured by the next day, into two containers. One container goes in the fridge and the other in the freezer. 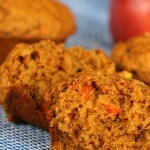 Give them a quick zap in the microwave when you’re looking for a healthy treat or eat them straight from the fridge. My boys love to eat them on the way to school as an on-the-go breakfast. I hope you enjoy them as much as my family. 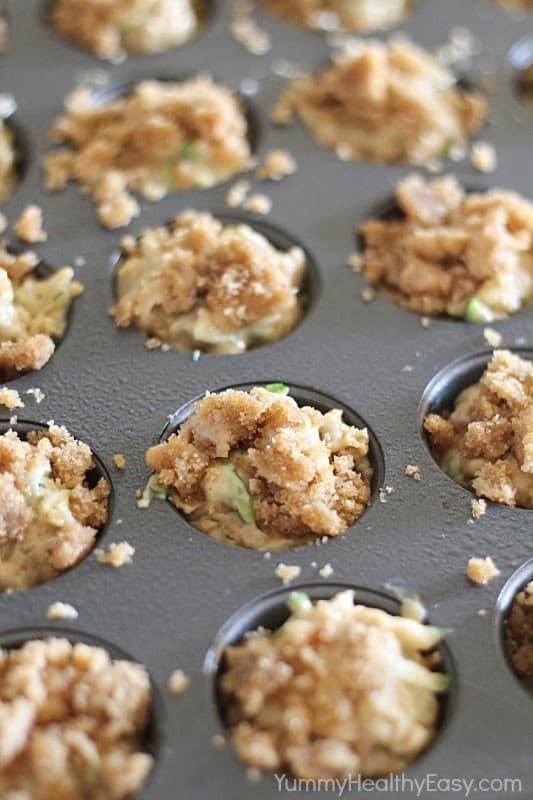 Preheat oven to 375*F. Spray a 24-cup mini muffin tin with cooking spray or line with paper liners. 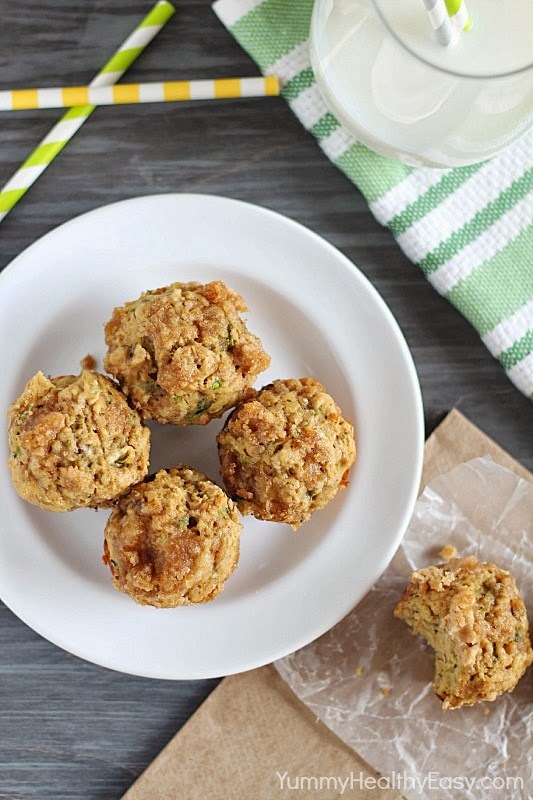 In a large mixing bowl, combine mashed bananas and shredded zucchini. Beat in egg, Truvia (or sugar) and ½ cup melted coconut oil. Hi! I’m Jen from Yummy Healthy Easy. I’m a recipe addict, cookbook collector, and all-around lover of food! I’m also a mom to four crazy boys. When I’m not carpooling them around to ball games or play dates, you can usually find me in my favorite room in the house – the kitchen – where I love creating yummy, healthy and easy recipes. I hope you’ll stop by and visit me soon! Yum, those muffins look delicious! 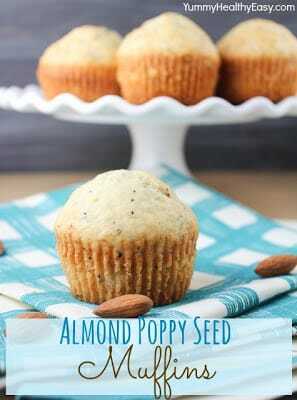 I am always looking for new ways to make muffins healthier. Thank you for the recipe, simple and healthy. approximately how many cups of zucchini ?